C² abandoned me this week to head to Grenoble, so I was left to entertain myself on my two days off. In Seattle, I’m so used to having so many wonderful people to surround myself with (and to fill up all of my time with), that it’s been quite an adjustment to have to spend so much time by myself. But, I’m getting through. And Isaac will be here in less than a month, which will be wonderful. He’s currently scheduled to be here for 2 weeks (arriving on Friday, February 25th, and leaving on Wednesday, March 9th). But, there’s so much I want to do and see with him that I’m trying to convince him to change his return ticket so that he stays for an additional weekend. We’ll see if that works out. 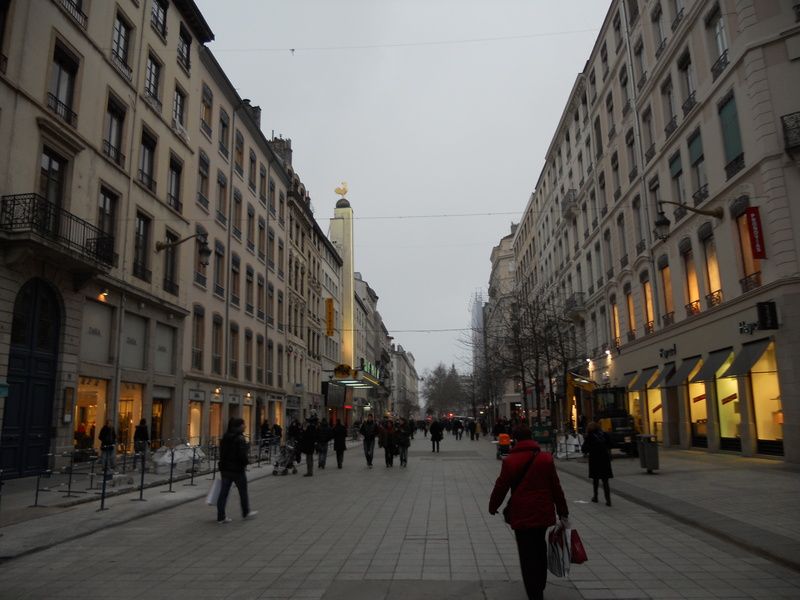 Anyway, to entertain myself on Thursday, I ventured out to an outdoor shopping district around the Place Bellecour. I’ve been out there a few times (it is right next to where Cynthia lives) and it is a wonderful place for people watching. So, I spent some time wandering through stores and checking out all of the people who were busily getting the most out of les soldes. 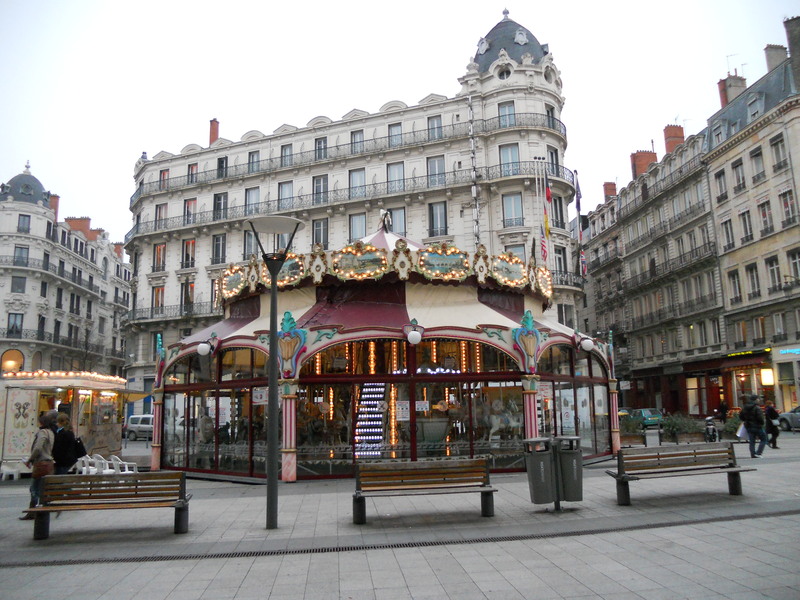 The carousel on Rue de la République. 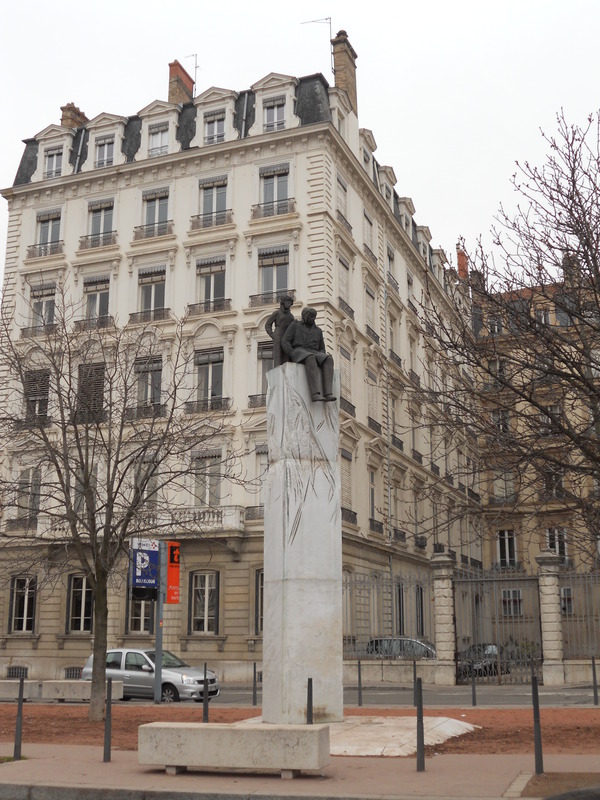 After wandering around and people watching, I decided to seek out the statue of Antoine de Saint-Exupéry. He was the author of Le Petit Prince and he came from Lyon. 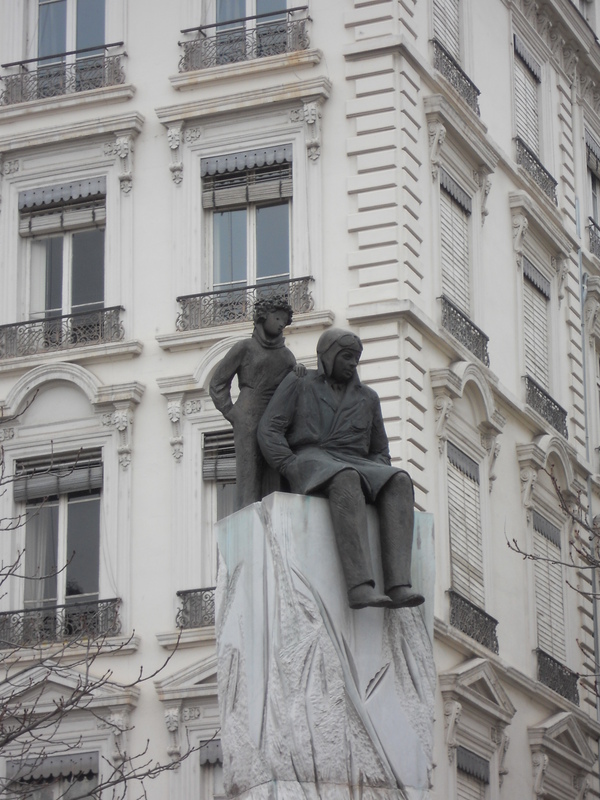 I had been told that there was a statue of him with the Little Prince, but I hadn’t seen it yet. I wandered around Place Bellecour twice before finding it, but I finally saw it! No wonder it took me so long – it’s quite small and actually is across the street from the Place. See? It’s less than impressive. But finding it gave me something to do. Last night, I had a camera fiasco and thought that I lost all of the photos that I had taken yesterday. It did not make me happy. 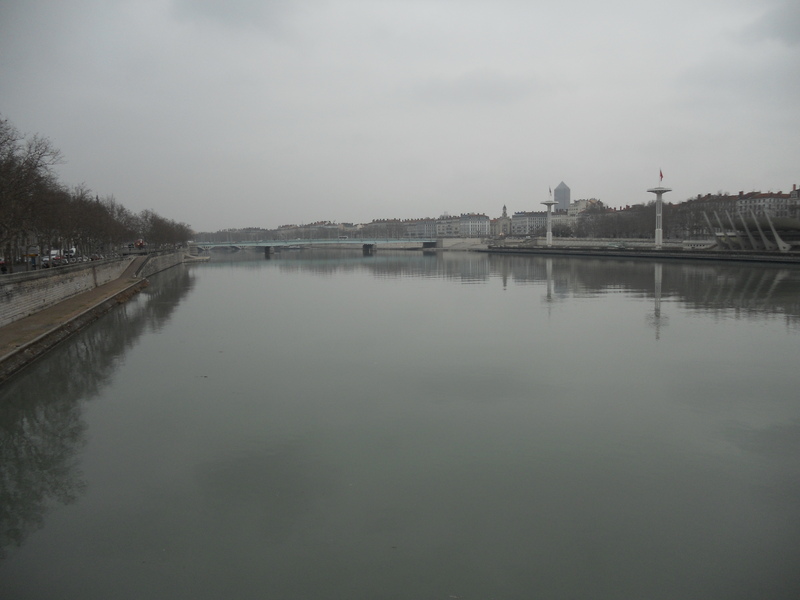 So, this morning (Friday), I wandered around trying to retake a number of the photos. However, I just realized that the pictures did get saved last night, so my trip this morning was unnecessary. Oh well – it gave me some exercise and got me out of the house before noon. That’s a plus. 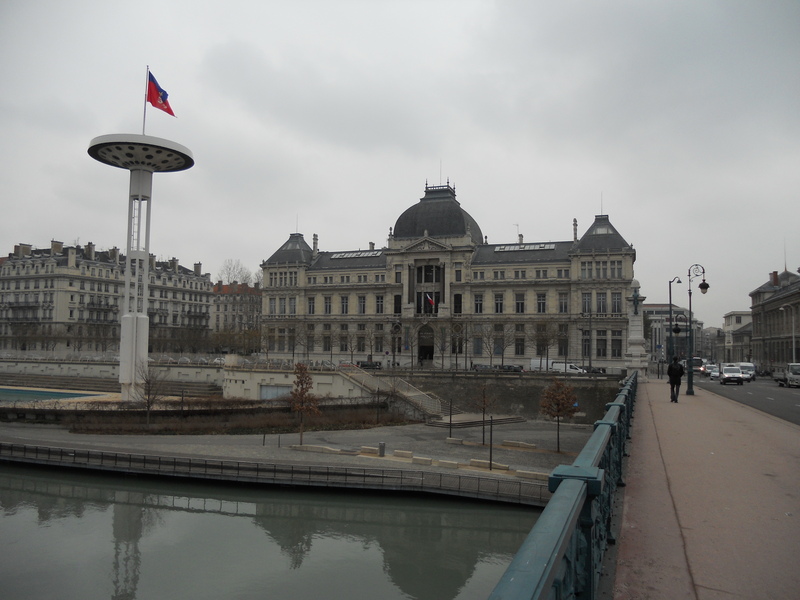 Also, I took these photos of the University I am attending and the bridge which goes over the Rhône River (between Place Bellecour and the university). L'Université Jean Moulin III Lyon. I have five hours of class today, then will be off until Tuesday. 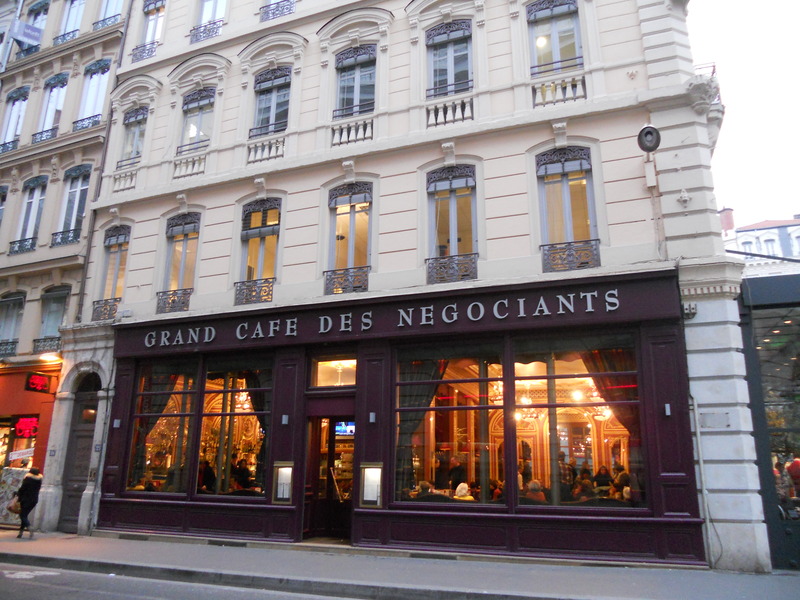 I actually am supposed to have class on Monday, but Colton and I have pre-existing plans to spend a couple of days in Marseilles (Sunday through Tuesday morning) to attend an opera and concert and to see the city. I’m looking forward to the trip! You study at my uni!! Hope you enjoy Lyon.